This strip is a reply to Rotation - tutorial, "SHIFT-TRICK" Tutorial, SG for DUMMIES Contest!, Only Zuber is mathematically perfect. Clicking on an object while holding down the Ctrl key will create a duplicate on top of the first one. Clicking on successive objects while holding down the Shift key, will select them as a group. 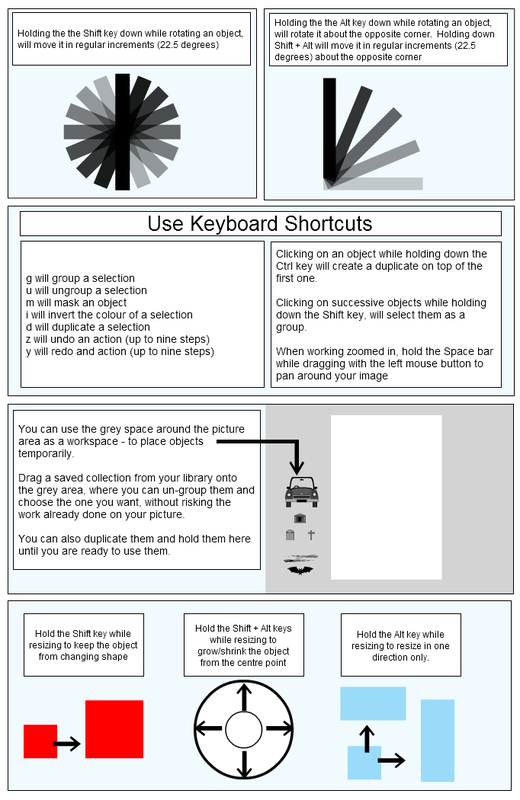 You can use the grey space around the picture area as a workspace - to place objects temporarily. Drag a saved collection from your library onto the grey area, where you can un-group them and choose the one you want, without risking the work already done on your picture. You can also duplicate them and hold them here until you are ready to use them. Hold the Alt key while resizing to resize in one direction only. even though using the grey area has sometimes crashed une of te library objects, making it impossible to delete it or to publish the strip. Really Good! I like it! Good stuff to know, fav'd. I'm new to all of this...thanks for the great tips! good to see you made a booklet! Thank you Occam, your tutos are so useful!